Adding different levels of sulphites to grape juice can significantly alter which yeasts are able to ferment the wine—and changes how the final wine tastes and smells. UBC Okanagan PhD candidate Sydney Morgan has recently published research about how sulphites, also known as sulphur dioxide (SO2), affect wine yeast and how this reaction may change the taste of a product. After a six-month study at two different Okanagan wineries, Morgan has determined that different wine yeasts react differently to SO2 depending on how much was added at the beginning of fermentation. UBC Okanagan PhD candidate Sydney Morgan conducts research on wine yeast strains and how they react to sulphites. Her research—conducted with Assoc. Prof. of Biology Dan Durall—examined a common commercial yeast called Saccharomyces cerevisiae. While there are hundreds of strains of this yeast, adding different levels of SO2 can create different environments in the grape juice that allow different yeast strains to grow and take over fermentation. It is the yeast strain profile, or yeast composition, that helps determine the final taste of a wine. Until recently, little was known about how different levels of SO2 at the early wine-making stage could create diverse environments that promote the growth of different yeast strains. 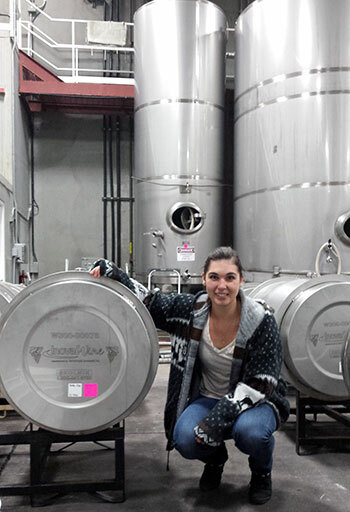 Morgan chose two wineries for her study: Cedar Creek Estate Winery, an established business with a 40-year-old building, and 50th Parallel Estate Winery, a new winery with a recently completed wine-making facility. The wineries are significantly different—from the age of the buildings, to the grapes used, and geographical locations. Using sulphur dioxide in wine-making is considered essential by some, but it is also controversial, she explains. In low levels, sulphites are not harmful to most people, and they can help wine makers as they prevent spoilage, prevent the browning of white grape juice, and improve the longevity of wine. However, some people react to sulphites; some feel nausea, while others may have a red face, hives, and asthma sufferers may have a more severe response. The research, partially funded by a grant from the BC Wine Grape Council and the Natural Sciences and Engineering Research Council of Canada, was recently published in the International Journal of Food Microbiology.